The end of the academic year is drawing near. You have prepared all year for your exams at the Horribilorum Sorcery Academy for Witty Witches and Wizards, and all your other exams went wonderfully. You drew up a perfect horoscope for your Astrology professor – he failed you at first, but upgraded you to an A++ when he actually was hit by a bus later that day. You made the whole class perform ‘Let’s do the Timewarp again’ for your Mind Control elective. And you turned a fellow student into a piano for Transmutation. That one was the easiest, he already had alternating black and white teeth. But you have to pass Potions to complete the year, and that exam is a bit unpredictable. The professor is what your German grandparents would have called a zausel. (Pronounced tsowsel, an old and unkempt man. A much better word than the dictionary translation ‘old buffer’.) And he’s been known to say things like ‘Keep in mind that the explosions you may trigger can be useful’. Maybe passing this exam is not as important as walking out of it alive. And sure enough, as you enter the room you see it: the dreaded, ancient ingredient dispenser, number one reason for sick days in this school. This is going to be different. And different is not only the exam style at Horribilorum, different is also the style of game that is Horrible Games’s Potion Explosion. It’s doubtlessly classified correctly as a boardgame, but the central component is not a board, it’s the above-mentioned ingredient dispenser, a box assembled from paper pieces with five slides coming out the front. 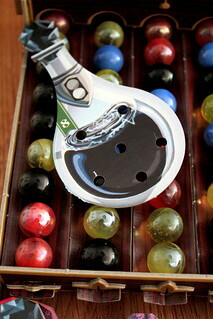 On those slides are heavy marbles in four different colors. They are the ingredients you use to brew your potions – and they are available at random, which is exactly what you want in an exam that will decide your academic future. But from everything I ever read about the Wizarding World, the ability to manage chaos is the most useful skill you can have there. Now, the exam rules are actually not very complicated. The exam is competitive, all students brew potions and are awarded skill tokens worth four points for either demonstrating a wide set of skills – they brew five different potions – or special mastery of one potions – they brew three potions of the same kind. When the professor has passed out a certain number of tokens he’ll call an end to the exam, declare the student with most points the winner. He’ll let the others pass or not depending on their hair color and whether he had a successful bowel movement that morning, just like that other famous magic school. You start the game with two potion recipes to complete and no ingredients. That is, of course, not an ideal ratio of those things if you want to win the game, and so taking ingredients from the dispenser is the one thing you have to do on your turn. And it’s easy, you just pick up a marble from the dispenser and take it back to your desk. But wait! Not so fast! What if you caused an explosion in the dispenser? Explosions happen when you remove a marble and the next marble rolling down hits another marble of the same color – or, in other words, when you remove a single marble of one color that is in the middle of a row of marbles of another color. What happens in an explosion is not at all what you’d be expect. There are no sirens, no flames, no injured people running everywhere. Instead, you get to take all the marbles of the same color that were connected in the explosion. And if removing them causes another explosion, you get to take those marbles as well in a wonderful chain reaction of getting things done. When I set off an explosion in chemistry class, what the professor did not do is give me more chemicals to play with. But I’ve ranted about safety standards at magical schools before. Overall, the ingredient dispenser works well as a component, especially considering you build it from punch out paper pieces. But sometimes, when taking out marbles from the middle of a slide, the marbles rolling down will not line up nicely behind the ones already in place but end up next to another marble on the same slide, and that messes up the whole line and you have to try and reconstruct it. You can avoid that by helping new marbles roll down slowly. But try explaining to your kids, who all seem to love the idea of the dispenser, that they shouldn’t let those heavy marbles roll freely. Just doesn’t work. It’s not a huge problem, but it does happen once or twice per game. More U-shaped slides could probably have avoided it. Take your ingredients and go back to your desk. Then you put those ingredients in one of your potions needing marbles of that color, and if that fill up all the spots in one potion you have completed it. It’ll be worth points when the game ends, and you fill the freed up spot on your desk with a new recipe at the end of the turn. Once your turn is over you can only keep three ingredients outside of potions, so instead of picking up many marbles, try to get the ones you need. Identifying the right marble to pick to cause explosions and take home many ingredients you can use is not the main tactical aspect of Potion Explosion. Sure, it’s important, but making use of your other options is what decides the winner. First, you can ask the old zausel of a professor for help with the ingredients. Every time you do so will cost you two points, but it lets you take one marble from the dispenser. Taking this marble can not cause an explosion, but since you can do it before your regular take it’s a great opportunity to set up an explosion. Second, you can drink the potions you mixed and profit from their effect. They were just created by a student under stress with ingredients from an exploding dispenser – what could possibly go wrong? Remarkably, nothing ever goes wrong, the potions always have their effect as described. Half of the eight types of potion let you take ingredients from the dispenser, either a single marble, all connected marbles of one color and the like. The remaining potions have more diverse effects. The Elixir of Blind Love, for instance, lets you charm another student into giving you all ingredients he has that are not yet used in potions. The Potion of Prismatic Joy allows you to place the ingredients you are holding in potions you’re brewing even if the color doesn’t match. You can use more than one potion per turn, by the way, because bad interactions also don’t exist in the Wizarding World, and chaining the right potions together at the right time can be game-deciding. That’s something to keep in mind when picking the next recipe to brew. Points are nice, skill tokens for more points are even nicer, but the right potion effect might trump both. I think it’s obvious by now that Potion Explosion is a family game. 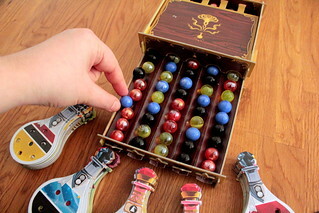 Also that magic schools have lousy safety procedures, but my point is that Potion Explosion is a family game. It’s not designed for heavy strategy gamers. But it does offer a lot of tactical decisions every round, most of which are meaningful and have a real impact on the outcome of the game. There’s not a lot of interaction with the other players, but that’s okay for a game in this category. Also, despite some minor problems with the dispenser as mentioned above, the idea of it works quite well and makes for a fun game mechanic. 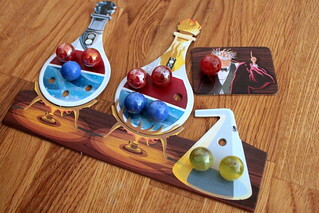 And with the beautifully illustrated potions and the big, colorful marbles Potion Explosion is a pretty game, too. It’s a great choice for family gaming and as a lighter distraction with your gaming group.